The Common Raven, sometimes called the Northern Raven, is an amazing bird. Largest of the passerines, or perching birds, it has long been noticed, loved, and reviled for its size, its smarts, its je ne sais quoi. 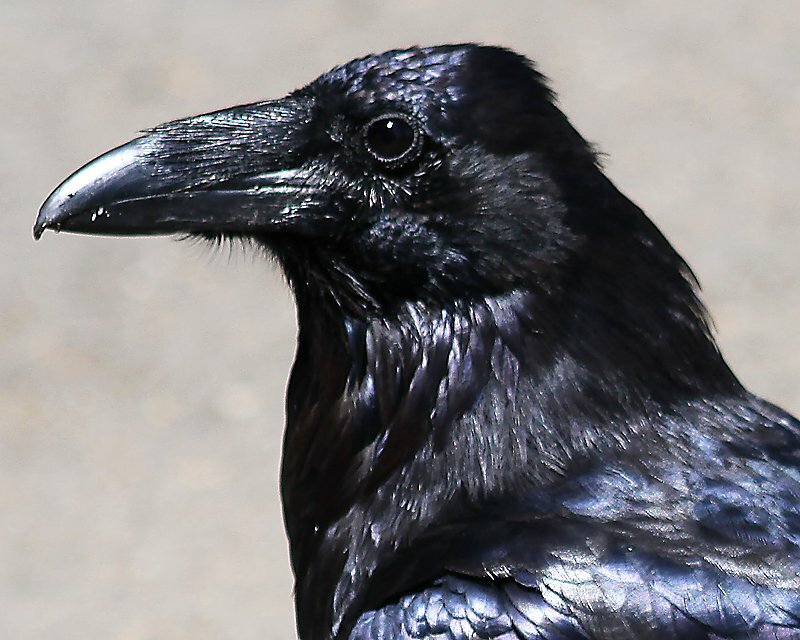 The raven makes an appearance in essentially every mythology that sprung up in its range from Christianity to the tales of trickster gods common among indigenous Americans of the Pacific Northwest. Found in literature as varied as Shakespeare, J.R.R. Tolkien, and Edgar Allan Poe, on flags and other trappings of the state from medieval times to the present day, and in imaginations always, Corvus corax has proven fascinating from the Stone Age to the Space Age. How could it not be so? Extraordinary cleverness can often be explained by “simpler” hypotheses, and I’ve always prided myself on my skepticism. But skepticism in what? 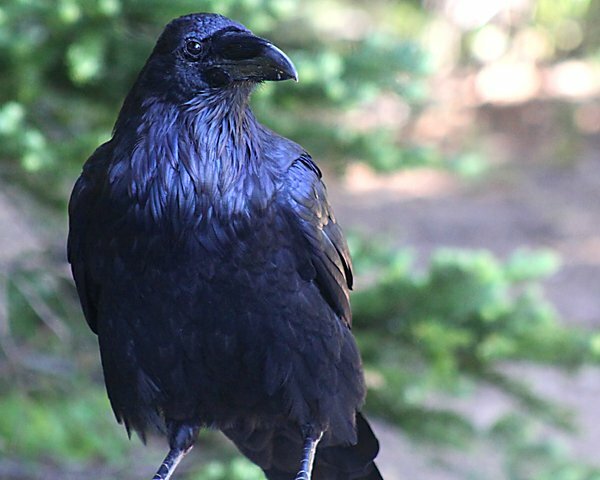 With ravens I’m no longer always sure of how to distinguish a simple from a more complex hypothesis, how to know whether all of the ravens’ behavior is somehow complexly preprogrammed or whether they know or learn to know what they are doing. I, for one, think ravens are smart, can learn, and, for that matter, have personality. But I am a lowly bird blogger with no scientific credentials at all. The Common Raven is found across the northern hemisphere and because of this huge range and its large and growing population it is considered a Species of Least Concern by BirdLife International. That is some seriously good news for those who love big, smart, black birds. Anyway, I hope you enjoy these pictures and get a chance, someday, to see a raven at such close range as well. If you liked this post and want to see more great images of birds and other creatures make sure to check out 10,000 Clicks, our big (and growing) page of galleries here at 10,000 Birds. Ravens are amazing birds. I associate them with the Northwest, having first encountered them in Oregon. More recently, I’ve watched – and HEARD – them on visits to British Columbia. What’s the news on our NYC ravens? The entire Corvus genus show remarkable signs of intelligence, from the ability to use tools to the ability to solve complex puzzles. There is no way one can ascribe some feats as mere ingrained behaviour over native intelligence. 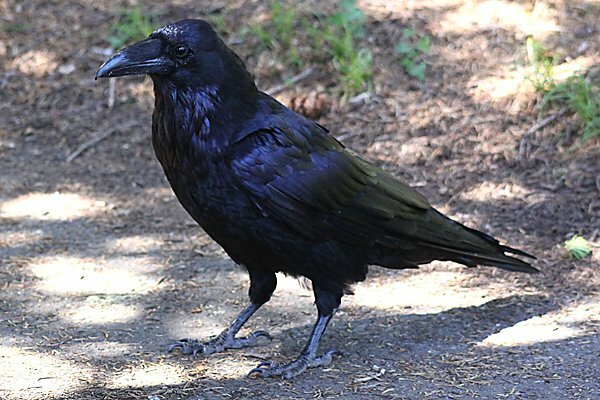 In particular I’m thinking of the crows that have figured out they can drop a nut (or shellfish) into traffic, wait for a vehicle to run over it and break it open, then – and this is the part that really gets me – wait for a traffic light to change so that it is safe to go get it. Dropping a hard shelled food morsel from a height is likely ingrained behaviour but the rest is learned, and that requires intelligence. @Raven (my niece): They are fascinating birds! @Melissa (Out walking the dog): The nest failed this year after they built a new nest on another part of the same water tower. Interestingly, another pair was found nesting on a water tower out in Suffolk County. @Doug Alder: Sounds like we are on the same page. I love ravens – if I could have any bird as a pet, it would be a raven. My favorite raven story is about a friend of a friend who was rock climbing somewhere in NH. He didn’t know it at the time, but there was a raven nest many feet above his head. The parents actually pick up stones in their beaks and dropped them on this guy as he got closer. We are fortunate to have many ravens here in Alaska. I agree 100% with your post but I waould add joker to the list. They are hilarious to watch sometimes and their ability to play in the thermals will hipmotise you. Ravens are one of my favorites. @Brett: Here’s hoping you don’t try to get a pet bird…but, yeah, I would pick a raven if I had to choose one. @Jason (Opposable Chums): Smart that is, though I have seen House Sparrows engaging in the same behavior. I wonder if they learned from ravens? I loved Heinrich’s Mind of A Raven. 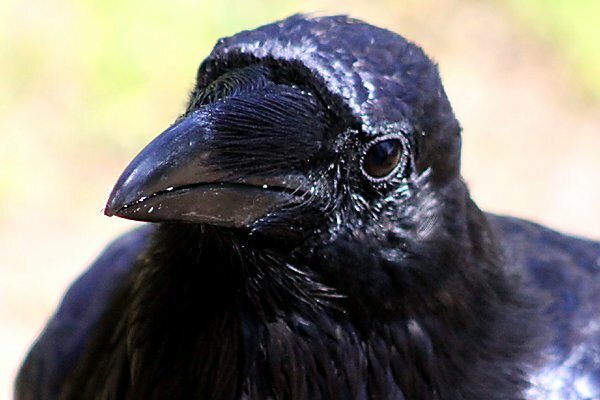 Also Bird Brains: The Intelligence of Crows, Ravens, Magpies, and Jays by Candace Savage. Although not a ‘scientist’ per se, she brings such passion to her writing about these intelligent creatures. 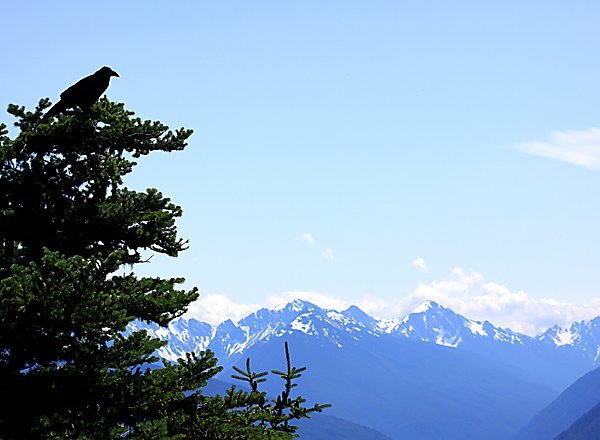 Here on Gabriola Island in the Pacific Northwest ravens abound, which is wonderful most of the time. But during ‘teach the youngun’s to fly’ season, anyone hoping to sleep beyond dawn is out of luck. Such a racket! … And last year I stopped my car after being jolted by a very loud POP! – thought I’d blown a tire – but no, it was ‘just a raven’ – not sure what the communication was about. Sometimes I wish I spoke raven: I’d like to have a little chat with them. 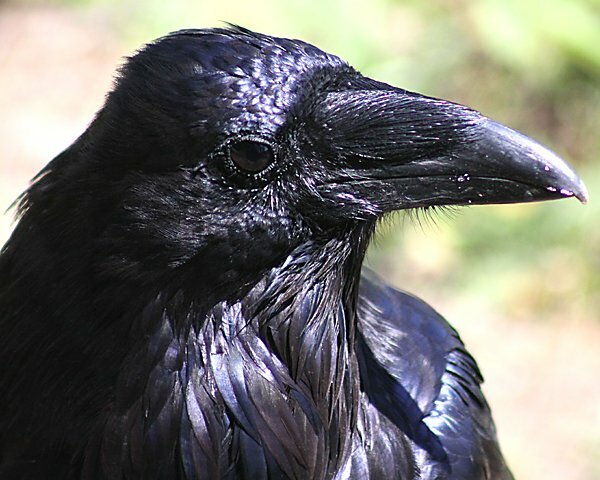 Some people think of ravens as pests, but I think they’re beautiful and yes, very intelligent. Looks like Heinrich’s Mind of A Raven is my next read! I hope to get to see one some day. @Sharon: That is a good book! And, yeah, I would love to speak raven! @Jerry Hingle: You can’t go wrong with any of Heinrich’s books. They are all amazing. Gorgeous pics, Corey and, there is nothing lowly about you. Seriously. Ravens are by favourite bird and anyone who doubts their intelligence has never spent time near them. I have so many stories. Wonderful photos Corey, wonderful post. Great photos, and nice write-up about my favourite bird. Love the close-ups especially. I am an artist. Would you be willing to sell or lend any of these raven photos to me as reference photos? We have ravens here in Quebec, but I never seem to capture them with the camera. @Alyson: I will email you.